The much awaited smartphone from HTC “HTC Legend” is launched in India. It has a 3.2” AMOLED capacitive touchscreen and supports 16M colors. 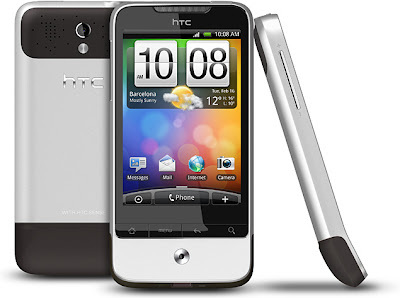 The successor of HTC Hero, HTC Legend has a HTC Sense user interface besides an Android Eclair 2.1 OS, that makes it a worthy buy. The device also comes with features like Sense UI, accelerometer sensor for UI auto-rotate, multi-touch support and optical trackball. An avid radio listener can now enjoy stereo FM radio with RDS with a 3.5 mm audio jack which is compatible with any pair of headphones. Its USP is that it is made from single block of aluminum, comes with a good 5MP camera and powerful 600 MHz Qualcomm MSM 7227 processor with 384 MB RAM and 512 MB ROM. HTC Legend boasts of a 1300 MAH Li-ion battery which gives a battery back up of upto 7 hours on a 2G network and upto 6 hours on 3G network. This unibody smartphone has a 3G network with A-GPS support. It also supports wireless Internet with Wi-Fi 802.11 b/g and file transfer via bluetooth 2.1. The gadget comes in Gray and Black colors and is launched in India at price of Rs.25,990.